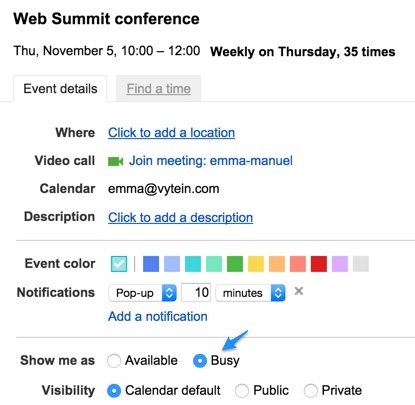 By default, when you add an event to Google calendar or when you accept a meeting that it is added to your Google calendar, you are shown as busy for the event times. What does it mean? 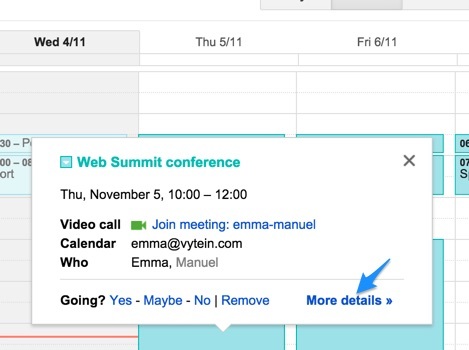 It means that if your calendar is shared with others, Google will show you as busy for the related periods of times. For recurring events that you do not attend even if they are in your Google calendar or for events you do not want to be shown as busy (example : notes added to your Google calendar), you would probably like to be shown as available. Indeed, for these particular events, you are not actually busy and would accept a meeting request at these times. Unfortunately, people you shared your calendars with think that you are busy and will not try to book a meeting with you at these times. In a company with “by default” shared calendars within employees, it can be very tricky to find a time that works for everyone if a lot of people are shown as busy for all the notes they add to their calendars or for recurring events added to their calendars they do not actually attend. But, there is a simple way to tackle this issue. Let see how I manage events to let Google calendar show me as available for specific events. There are two types of events : events you created by yourself and events you were invited to. I’ll show as I manage to make Google calendar show me as available for these two types of events. 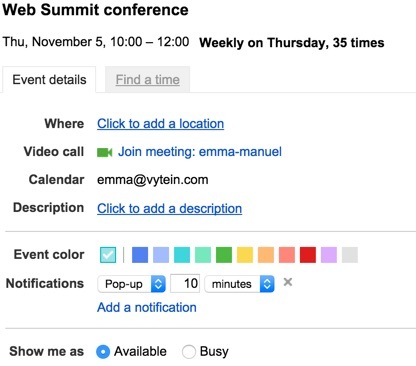 When you create an event with Google from your calendar, by default, you are shown as busy for this event. Before clicking on “Create event”, click on “Edit event”. You’ll get access to the details of your event. You need to scroll down until you reach the “Show me as available / busy” category. Then, click on “Show me as available” to be shown as available for the event you are creating. Click on “Save”. You’re done! If you were invited to an event, it is likely that you are shown as busy for this event. To check and have Google show you as available, click on your event and then click on “More details”. You get access to the details of the event you accepted and can edit what you want. In our case, scroll down until reaching the “Show me as available / busy” category. You just need to select the “Show me as available” option, to be shown as available for this event. That’s it! vyte is Google hands-off scheduling app to let people book a meeting with you at a convenient time. 1. 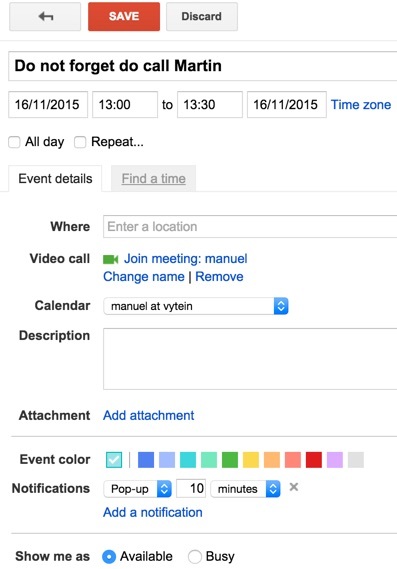 Set your scheduling page and share the link with anyone asking for a meeting. 2. 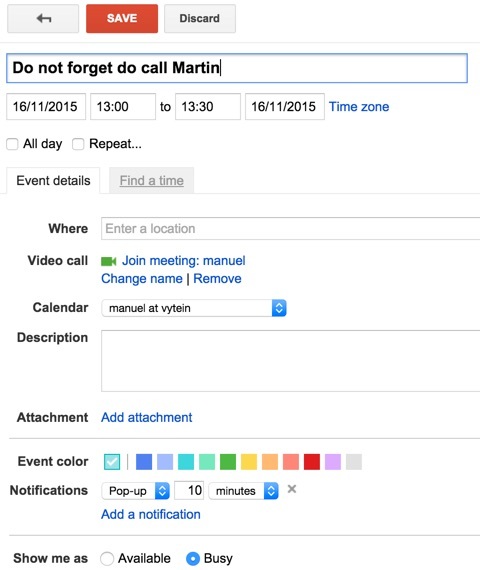 Set your Google calendars to set when you want to be shown as available or busy. 3. People visit your page and pick some convenient times for you. The event is added to everyone’s calendars. Is there a way to do this automatically? So that every time I create an event it is automatically “busy” and I don’t have to click it every time? It does on my main calendar tied to my e-mail address, but not on the additional calendars I’ve made (they automatically say “available”). Not sure why I’m having this trouble because I can’t find anyone else talking about it when I Google it. Thanks anyway.